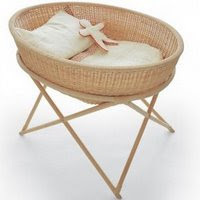 The Seed Organic Cradle is made from breathable organic cotton, with a natural latex breather hole mattress. 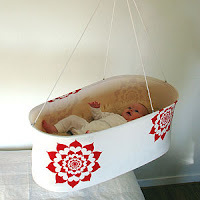 It creates a serene environment for your newborn to nap in and hangs freely for a soft natural rocking motion that will soothe and comfort. Organic cotton is a term used to describe cotton that is free from chemicals. The cotton seeds are GM (genetically modified) free and throughout the growing process the cotton has not been sprayed with herbicides, insecticides, and fungicides. In finishing the cotton all dyes used are free from heavy metals such as lead. Their Organic Cotton is certified to International Standards and is softer, smells better and is stronger than chemically treated cotton. 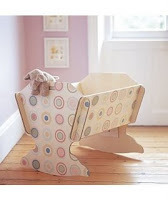 It’s also hypoallergenic, breathable and provides a more natural, safer environment for your baby. Latex is a 100% natural organic product derived from the milky sap of the Hevea Brasiliensis (Rubber Tree) . It is hypoallergenic, ant – microbial. (does not grow bacteria or mould) It will contour to the shape of your baby’s body building up no pressure points and is a breathable open cell structure for better air circulation. 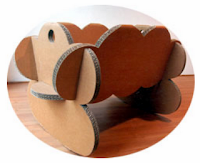 The mattress base has been designed with breather holes from top to bottom. 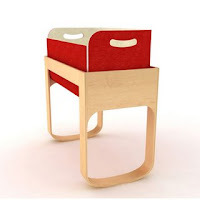 This allows air to move freely throughout the cradle and ensures that your baby has the best air circulation possible. The cradle is designed with a pocket for the mattress base to slide into, ensuring that the base always stays horizontal the ground and your baby will not roll.